So in the first part of this "life-automation" mini-series, we set up some OpenHAB items that kept track of whose turn it was to do a chore or make a decision. That's fine, but not super-accessible for the whole family, which is where our Google Home Mini comes in. Next, using an HTTP client such as Postman, we hit https://myopenhab.org/rest/items/MovieNight/state (sending our email address and password in a Basic Auth header) and sure enough, we get back Charlotte. 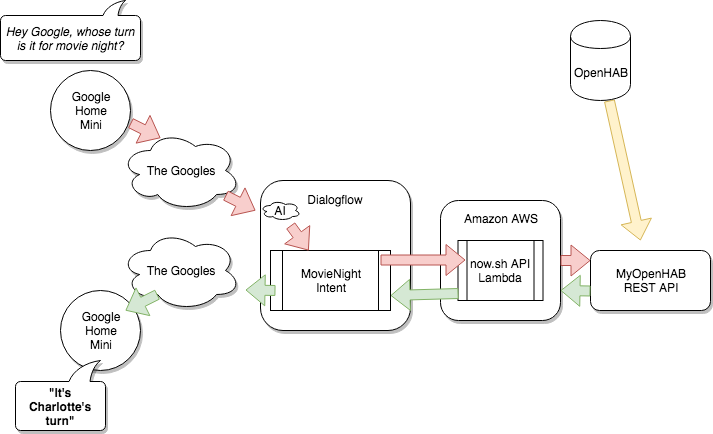 So over in the Dialogflow console, we set up a new project, which will use a webhook for "fulfillment", so that saying "OK Google, whose turn is it for movie night? 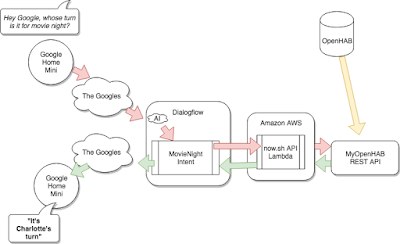 "* will result in the MovieNight "Intent" firing, making a webhook call over to a now.sh lambda, which in turn makes the RESTful request to the MyOpenHAB API. Phew! I've mentioned now.sh before as the next-generation Heroku - and until now have just used it as a React App serving mechanism - but it also has sleek backend deployment automation (that's like Serverless minus the tricksy configuration file) that was just begging to be used for a job like this. The execution environment inside a now.sh lambda is super-simple. Define a function that takes a Node request and response, and do with them what you will. While I really like lambdas, I think they are best used in the most straightforward way possible - no decision-making, no state - a pure function of its inputs that can be reasoned about for all values over all time at once (a really nice way of thinking about the modern "declarative" approach to writing software that I've stolen from the amazing Dan Abramov). It returns the smallest valid JSON response to a Dialogflow webhook request - I did spend some time with the various client libraries available to do this, but they seemed like overkill when all that is needed is grabbing one field from the request and sending back one line of JSON!